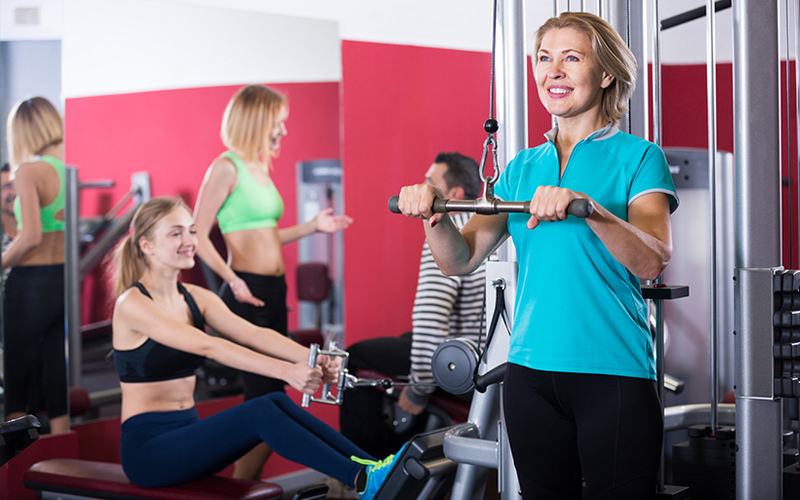 Does going to the gym cause hearing loss? Can you prevent workout-related hearing loss? Make sure your workout isn’t damaging your hearing with these quick tips. You understand how important exercise is to your health and wellbeing. Cardio keeps your heart healthy. It curbs obesity. You feel better. Strength training, in particular, has many benefits. It increases muscle mass, reduces body fat and improves balance. It decreases bone loss as you age. 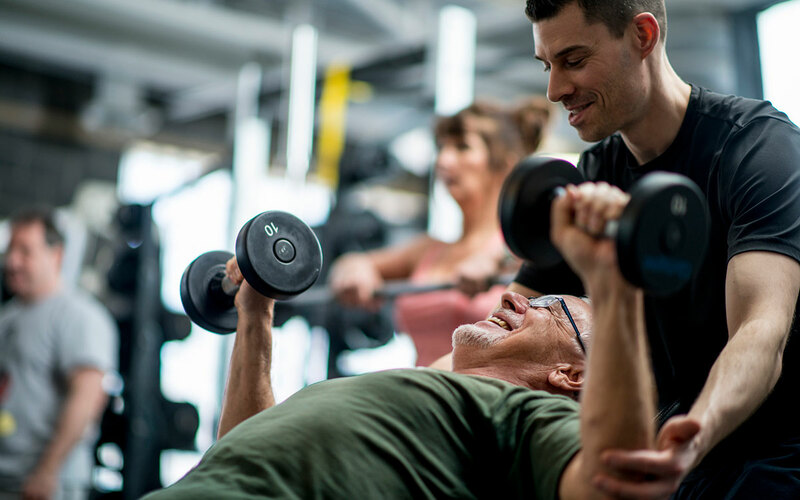 The CDC, American Heart Association, International Osteoporosis Foundation and many other important health organizations agree on the importance of weight training for older adults. Certainly, something as beneficial as working out couldn’t do you any harm aside from the occasional sports injury. Or could it impact hearing in ways you don’t realize? Let’s take a look at how your routine may contribute to hearing loss and what you can do to prevent it. Many workout routines push you to the limits of your endurance. That’s where you’re able to break down muscle tissues and form new muscle. When muscles grow, it’s actually the tissue repairing the muscle. As these protein-packed tissues, called myofibrils, fuse the muscle fibers together, the fibers become a part of a bigger, stronger muscle. This, in and of itself, isn’t a bad thing. But how you push yourself to attain those 15+ inch biceps, or those rippling thighs can be. Your goal may not be to get “ripped” but rather to have a nice physique and to stay in great physical shape so you can continue to stay active and do what you love. These are worthy goals. But here’s where things can go terribly wrong in the weight room. What Causes Workout-Related Hearing Loss? There are several factors that contribute to hearing loss–some related to the workout itself, and some to the gym. The first hearing loss culprit is straining. When you strain to get in that last rep, you’re putting pressure on your brain. You already knew this. You could feel the blood rushing to your head. You could see how red your cheeks are when you lift in front of a mirror. You simply may have thought it was harmless. This straining causes pressure to build in the ears. Air is forced up through your Eustachian tubes. These manage the pressure inside your middle ear. If this pressure isn’t managed, then the pressure within or without would cause the eardrum to burst in or burst outward. That’s why your ears pop when you hike in the mountains, go scuba diving or fly. The Eustachian tubes are regulating the pressure. Straining can also cause enough pressure to generate a perilymphatic fistula (PLF), which is a tear in the membrane that separates the middle ear from the inner ear. Such a tear will cause sudden hearing loss and balance issues. People who suffer from this will first notice a feeling a fullness in their ears. This is often accompanied by extreme pain, dizziness, and intolerance to sudden movement. If they continue to work out with this injury, the symptoms will become worse and complete, and permanent, hearing loss may result. Straining while lifting can also lead to exercise-induced Eustachian tube dysfunction . Overuse causes the tubes to become inflamed. This inflammation blocks the flow of air through the tubes, making them less effective. Less effective Eustachian tubes means you’re more prone to exercise-induced hearing loss. The second culprit is holding your breath. You may hold your breath to put all of your power toward the lift. But in doing so, you’re further increasing the pressure on your brain and in your ears. This isn’t just a bodybuilder problem. If you’re taking spinning, Zumba or other aerobics classes, chances are the volume is cranked up to damaging levels. Outside in the cardio and weight room, the music is blasting. TVs are blaring. Or you may choose to get in the zone with your own music through earbuds. Weights are clanking on polls, racks and machines. Even if you skip the gym and go for a jog, chances are you’re taking your music with you. All of this impacts hearing. Now, let’s look at the warning signs of hearing damage. Temporary Tinnitus — If you have ringing in your ears when you leave the gym, chances are your workout routine is impacting your hearing. Frequent Tinnitus — If the tinnitus is arising while you’re at home and becoming more frequent, hearing damage is definitely occurring. You feel sore immediately after or during your workout — Muscle soreness should occur 24-48 hours after a workout. If you feel soreness or pain during a workout, you’re pushing your body (and your ears) too far. Your ears feel full while working out — Unless you have a cold, in which case you shouldn’t be a the gym anyway, a full feeling in the ears means the pressure in your ears is too high. You’re turning red — If you’re turning red or have veins bulging in your head or neck, you’re at high risk of exercise-induced hearing loss. Now let’s talk prevention. You love the gym. Working out is good for you. You’re not giving it up. You don’t have to if you take these simple steps. Avoid straining and holding your breath while lifting. If you experience PLF symptoms (such as dizziness, imbalance, vertigo or vomiting), stop lifting immediately and schedule an appointment with your doctor. Know when enough is enough. Extreme weight lifting has more risks than rewards. Wear earplugs when music is loud. You can get earplugs that only block 20 decibels or so. Most people can still enjoy the music or hear an instructor with that level of protection. Be mindful of how loud your headphones are. At full volume, a typical portable music player can produce 115 decibels. Hearing damage starts at 85 decibels. Use the 60/60 rule. No more than 60 minutes at 60% volume. Be aware that earbuds increase sound by around 9 decibels over regular headphones. If you use earbuds, lower the volume even more. Get noise-dampening headphones. This blocks outside noise so that you don’t feel the need to turn your music up so loud. Get a sound meter app on your smartphone. Test the noise levels in your gym. Protect yourself accordingly. Get a hearing test if you notice any changes in hearing, including hearing sounds that aren’t there like ringing. There are several hearing-friendly activities you can do to improve strength and balance. The International Osteoporosis Foundation (IOF) found that older adults who practice Tai Chi have 47% fewer falls and 25% fewer hip fractures. Through bone density scans they were able to confirm a slowing of the usual bone loss in postmenopausal women. Tai Chi strengthens the whole body, but especially the legs, through fluid dance-like movements. If it can do this much in people already suffering from arthritis, imagine what it can do for you. While you may think of yoga as a flexibility activity, know that yoga includes many poses that increase upper body, lower body and core strength while reducing the risks of exercise-induced hearing damage. A Harvard Medical School study performed DEXA scans on 741 people. 227 of these participants practiced yoga regularly. The others were the control group. The DEXA scans revealed that the people who practiced yoga had significantly higher bone density in their backs and slightly greater density in their hips. Yoga and Tai Chi also help lower blood pressure, which can help prevent hearing loss. Free weights and bands help you build and maintain upper body strength without lifting-induced hearing damage. One study looked at adults 60 and older. This study confirmed, as has been shown in other studies, that you don’t have to lift at your max to build muscle mass even as an older adult. Lifting weights or using resistance bands at just 60% of your total strength capacity builds muscle and improves bone density efficiently and safely without that risk of hearing damage. Lifting something at 60% of your total strength requires no straining or holding your breath. For more tips and information about protecting your hearing as an active adult follow our blog.